General Secretary of the Communist Party of China (CPC) Central Committee Xi Jinping met with former Kuomintang (KMT) chairman Lien Chan in Beijing on July 13, during which Xi urged the Taiwanese side to stick to the one-China policy and work with the Chinese mainland to revitalize the Chinese nation. “We have strong confidence and capacity to push peaceful development across the Strait and promote China’s peaceful reunification,” Xi said at the meeting, the Xinhua News Agency reported. “The mainland and Taiwan share a common destiny and it conforms to the general tendency and the interests of the whole Chinese nation that both sides work together for peaceful development,” he added. Lien, who was accompanied by a delegation, echoed Xi, and proposed warming up the cross-Strait relationship by re-starting talks and increasing economic and cultural exchanges. This was Lien’s 16th visit to the mainland, the significance of which, according to analysts, was no less than his first visit to Beijing in 2005. This is still regarded as a watershed in the cross-Strait relationship since Taiwan was separated from the mainland in 1949 when the KMT, at that time the ruling party of China, was defeated by the CPC and retreated to Taiwan. After eight years of Democratic Progressive Party (DPP) rule on the island, the KMT won re-election in 2008, after which cross-Strait relations turned a corner. Both governmental and non-governmental exchanges flourished, and relevant systems greatly improved. 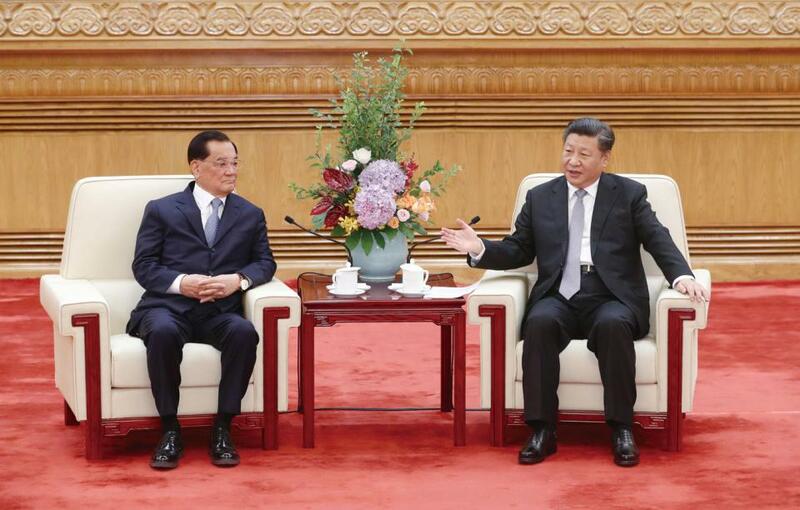 In 2015, former KMT chairman Ma Ying-jeou met Xi Jinping in Singapore. Consensus, in which the mainland and Taiwan agreed on the one-China policy, though the two sides have different understandings of what “one China” is, and cross-Strait exchanges have often been interrupted. Lien’s latest visit to Beijing is expected to serve as an icebreaker. Before his visit, Taiwan’s United Daily News cited Lien’s office as saying that the five visions for peaceful development Lien proposed during his 2005 visit to Beijing provide a chance for cooperation across the Strait despite the worsening relationship. Lien’s visit received wide support in Taiwan. Taiwan political commentator Huang Chih-hsien, who was a member of the delegation, told media that she was excited as Xi Jinping talked about the affection across the Strait, and that no nation will be revitalized until it is reunited. Chao Chien-min from the Taiwan-based Chinese Culture University said that Lien’s visit had at least eased the risk caused by a lack of communication across the Strait.